Discovery Reply has been serving the digital-media market since 2003, supplying end-to-end solutions for managing the entire life cycle of multimedia content (videos, images, audio and documents). Discovery Reply MultimediaTM is Reply’s enterprise-level digital asset management suite for building vertical applications for various industrial sectors, from manufacturing, finance and fashion to retail, broadcasting and security. After Fiat Industrial S.p.A. and CNH Global N.V. merged to form CNH Industrial, the need arose for a platform to systematically and efficiently manage the processes of communicating with the new community of staff in the Parts & Service (P&S) division. The P&S Channel project aimed to create a platform as the communication channel for Parts & Service management, offering a space for collaboration and knowledge sharing for all P&S employees. CNH Industrial selected Reply’s solution underpinned by TamTamy™ and Discovery Reply Multimedia™ to support its communications to staff all over the world, through various digital media: video, images, presentations and text. CNH Industrial N.V. was established in November 2012 and became operational in late September 2013 after the merger between Fiat Industrial S.p.A. and CNH Global N.V. was completed. CNH Industrial Parts & Service wanted to foster a shared identity among the newly united community of employees and to promote regular, structured communication from the management. Hence, they needed an internal-communication and social-networking platform that exploited a range of digital media, including video messages, while gathering staff feedback. The ability to measure the initiative’s impact and staff engagement was a vital requirement. The Parts & Service staff are spread across CNH Industrial’s offices worldwide. Therefore, it was also important to be able to address messages to specific geographical regions, with each region having its own administrative and editorial role, and to provide a globally shared communication and working area. Reply has supplied both the design capabilities and the technology platforms, actively supporting CNH Industrial right from the initial analysis stages. With our expertise in internal communications, digital asset management, and enterprise social networking, Reply was involved throughout the project. The full solution exploits a close integration of two proprietary platforms: TamTamy™ and Discovery Reply Multimedia™, both supplied in Software-as-a-Service (SaaS) guise. This approach offers great infrastructure flexibility and saves CNH Industrial the cost and trouble of managing the technology assets, which are overseen and maintained externally by Reply. TamTamy™, the Reply group solution for developing enterprise social networks and business communities, provides the technology foundations for the internal-communication platform. 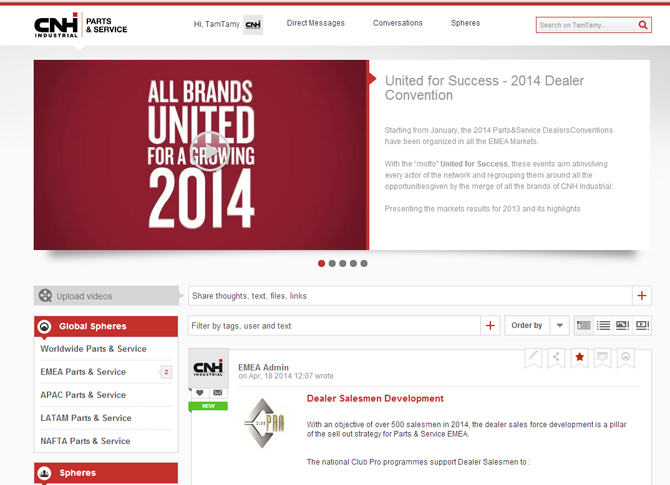 It has been configured and tailored to meet CNH Industrial group’s brand-identity guidelines and security policies. Employees can have a personal account to use the various social features provided with TamTamy™, such as commenting, sharing and voting, to interact with the content and with one another. A flexible, configurable notification system keeps users up to date with all the latest happenings on the social network. 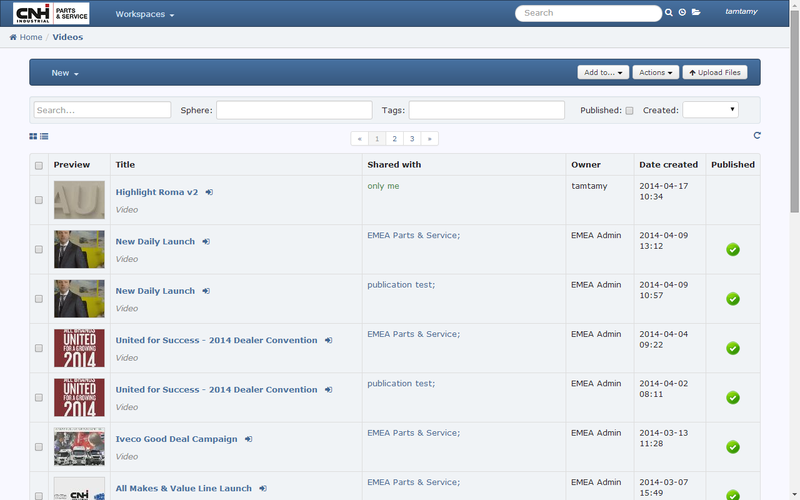 Spheres, a complete system for managing groups and authorisations, gives each geographical region a private communication area with fully separate administration and content management, completely independently from the rest of the community, while a “Worldwide” Sphere offers a top-down global communication channel. In any case, staff are free to create Spheres of their own, for sharing content and communicating with colleagues across the planet. For authentication purposes, TamTamy™ has been integrated with the CNH Industrial corporate systems, thus providing employees with a uniform experience of the other applications used internally. The Digital Asset Management (DAM) system, Discovery Reply Multimedia™, acts as a centralised repository of all the digital media published on TamTamy™. It enables multimedia content, like video in various formats, to be imported and automatically transcoded into the right formats for publication on the web. 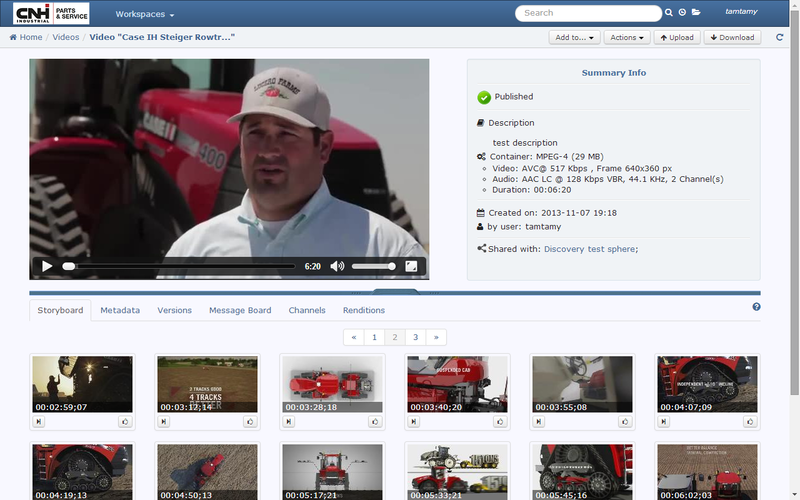 Courtesy of a video-on-demand web widget controlled by the DAM system and integrated into the TamTamy™ front end, users can add semantic tags to the videos to enrich the various multimedia information. In addition, the solution enables CNH Industrial to manage all the digital content about its corporate events and to organise the material into sessions and collections. Today’s workspace is on-the-go. Implico Reply & Workplace help you break down geographic and technology barriers to communication and collaboration to satisfy the needs of your changing workforce. Workplace’s personalized feeds, live chat, video broadcasts, secure file sharing and familiar interfaces encourage open communication that accelerates idea sharing and drives productivity.